Made by Mambo Graphics Pty Ltd in Australia, Oceania, 1986. Men’s suit consisting of jacket and trousers in screenprinted bright yellow cotton. The screenprinted abstract pattern in grey and white consists of vertical straight and wavy lines, dashes and dots. (-1) Single breasted jacket, unlined, with two pockets and is fastened with two black metal buttons. 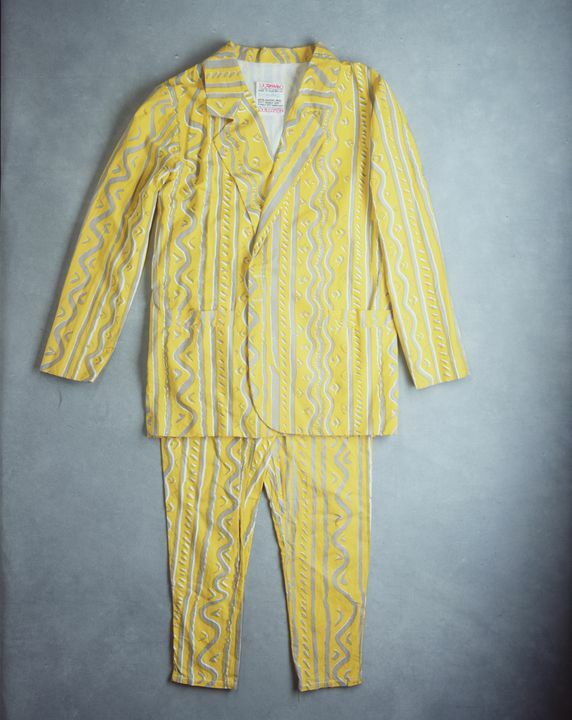 Men's suit consisting of jacket and trousers in screenprinted bright yellow cotton. The screenprinted abstract pattern in grey and white consists of vertical straight and wavy lines, dashes and dots. (-2) Trousers, unlined, fastened with zippered fly and single black metal button, loops for threading a belt. Manufacturer's label, beneath collar on interior of jacket and at waist band, centre back of trousers, sewn, printed cotton, text in pink, black and blue, "100% MAMbO/ MADE IN AUSTRALIA/ NOT SO SMALL/ WARM MACHINE WASH-/ DON'T BLEACH - DON'T/ TUMBLE DRY - WARM IRON/ 100% COTTON"
Fabric and suit designed by Mambo. Made by Mambo from Mambo-designed fabric chosen by the members of Mental as Anything. Worn by Martin Plaza, guitarist/singer with Mental as Anything, on the 'Australian Made' tour in December 1986 and January 1987. The tour, which played in the six Australian state capital cities, consisted of Mental as Anything, INXS, Jimmy Barnes, the Models, Divinyls, the Saints, the Triffids and I'm Talking. It was filmed by Richard Lowenstein for a concert documentary. 'By the time they hit the Australian Made stage in the full glare of the early afternoon sun, their cricket clobber had been replaced by a dazzling array of customised Mambo suits. 'When you're playing a big stage in the daytime, you need something that will make you stand out' defended suave Reg Mombassa, acclaimed painter and part-time guitarist. 'These suits can give you a headache if you're not wearing sunglasses.' (from Glenn A. Baker, 'Australian Made: Gonna Have a Good Time Tonight', Fontana Books, 1987, p20). 'The tour was a response to the massive Dire Straits tour which had mopped up so many of the Australian music industry's concert dollars. With a budget of $3.25 million, it was an exercise of its times. Major concerts in each capital city entailed a huge entourage flying across the nationwhile crew and international press were flown in from the US. 'Australian Made was a patchy success. By the time they reached the last show at Endeavour Field in Sydney on 26 January 1987 - Australia Day - political problems had blown up between the managers, and although when the tour began it was in the spirit of cooperation by the last show there was acrimony all around and some bands felt they had been railroaded into signing unfair contracts for the documentary film that was being made of the tour. 'Jeremy Fabinyi, representing the Mentals, had a confrontation with [promoter] Chris Murphy backstage that ended in blows. In the final concert film all mention of Mental as Anything was removed except for one shot of a fan holding up a sign. So much for a national spirit. 'To compound the disaster a saxophonist, Peter Trotter, died on stage that day during Mental as Anything's opening set' (Martin Fabinyi & Toby Creswell, 'The Real Thing: Adventures in Australian Rock & Roll', Random House, 1999, p151). Conceived at art school, Mental as Anything was born on a pool table in Sydney's Unicorn Hotel, where crowds for the fledgling cover band each Monday night in 1977 rivalled those gathered for the angry sounds of Radio Birdman further up the road at the Paddington Town Hall. The Mentals' music couldn't have been more contrary to the prevailing punk of the time, with quirky brothers O'Doherty and Mombassa, throaty vocalist Martin Plaza, zany harmonica player Greedy Smith and stoic drummer Wayne 'Bird' DeLisle pounding out pop classics by the Monkees and Wreckless Eric. It was only natural then that filmmakers Cameron Allan and Martin Fabinyi - reared on the pop planet of Phil Spector - decided to create a label just to record the Mentals. First release on the freshly minted Regular Records label was a novel triple A-side three-track extended play from the band, 'Mental as Anything plays at your party', which included the song 'The nips are getting bigger'. Sydney's ABC rock radio station 2JJ jumped on the song, and when the band's first album 'Get wet' was released the single became a national Top 20 hit - one of many hits the band has achieved. In fact the Mentals still hold the record of having more Top 40 singles to their credit than any other Australian band (even Sherbet) - 19 in fact. Big-selling albums and singles followed as the Mentals parlayed their cult art-school hi-jinks into popular beer-barn success, guided by their savvy manager Jeremy Fabinyi. Classics such as 'If you leave me can I come too?' and 'Too many times' - both from the platinum disc 'Cats and dogs' - shoved the band into the pantheon of Australian rock icons, with 'If you leave me' winning best single at the 1980 Australian Rock Awards. The Mentals teamed with fellow kooks Men at Work as special guests on the Men's North American tour before releasing the breakthrough album 'Fundamental'. Greedy Smith's ode to the lonely, 'Live it up', catapulted the band into the UK Top 10 and the they spent many years touring through Europe and America. Back home the crowds, as well as the nips, continued to get bigger as the band toured across the country and continued churning out the hits. Smart, witty and incisive, the Mentals clever lyrics and stage antics provided an amusing alternative to conventional rock-star posturing. As well as designing many of their own record covers and posters and conceiving filmclips for their songs, all the band members are highly successful visual artists. Truly one of Australia's most original bands Mental as Anything have been a major stylistic influence on Australian popular music and continue to tour and record, scoring a hit with the song 'Mr Natural' in 1995. Lent to the museum by Martin Plaza in 1993. Displayed in the 'Real Wild Child' exhibition 1994-98. Donated to the museum in 1999.